Softcover printed book = $50.00 with free shipping. DVD PDF format = $25.00 with free shipping. was originally assigned as a rifleman in Company A, 3rd Battalion, 506th Airborne Infantry, 101st Airborne Division and became the Public Information Officer (PIO) for the Battalion shortly after its arrival in South Vietnam in October of 1967. His task as the Battalion Combat Photographer and Reporter was to chronicle the Battalion’s tour of duty in South Vietnam through pictures and newspaper articles for the period of October 1967 to October 3, 1968. Berry was wounded at the beginning of the infamous Communist Tet Offensive of 1968 and received the Purple Heart Medal for his wounds in action. 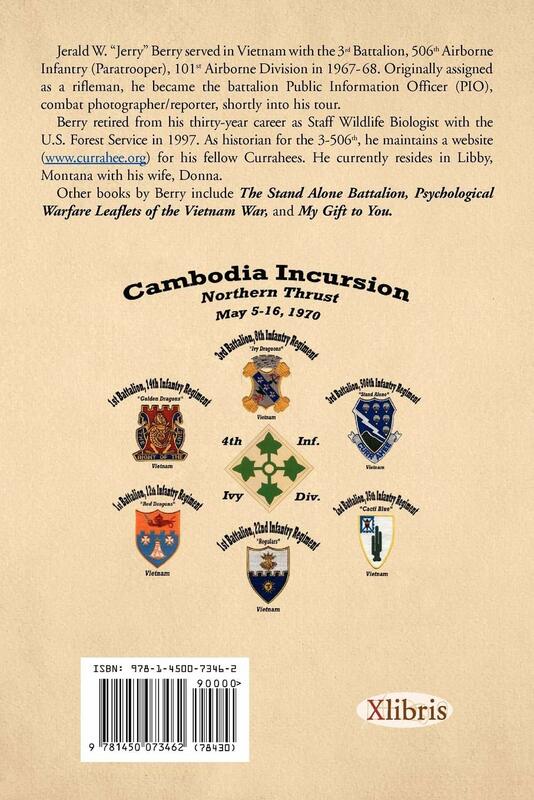 A wealth of photographs, newspaper stories, field interview notes, and personal diary entries came home with him from Vietnam and ultimately formed the basis for this book. After completing his tour of duty in Vietnam, Berry returned home to continue his thirty-plus-year career with the Federal Government--the U.S. Forest Service & U.S. Army Corps of Engineers--retiring as a Staff Wildlife Biologist in 1997. Jerry Berry (Webmaster) He is the author of numerous articles on the 3-506, as well as the books, "Psychological Warfare Leaflets of the Vietnam War”, "My Gift To You", "Twelve Days in May", and "In The Company of Heroes". He currently resides in Libby, Montana with his wife, Donna, and continues his dedication to the legacy of the 3-506 by maintaining two active Internet websites The Stand Alone Battalion and The Stand Alone Battalion 3-506 & TF 3-506 for his fellow Currahees and the members of Task Force 3-506th Units.